The taxonomy of Nihonkamoshika is Animalia Chordata Vertebrata Mammalia Cetartiodactyla Bovidae Caprinae Rupicaprini Capricomis C.crispus. Kamoshika are classified in ten species. It is nihonkamoshika, taiwankamoshika, gouraru, sumatorakamoshika, shiroiwayagi, syamoa, gourudentakin, saiga, zyakouushi, chiruu. Nihonkamoshika is similar to shika, but it isn’t a true shika. It is Bovidae. Nihonkamoshika is 30～45 kg weight. The shoulder height is 70～75 cm, the trunk is 70～85 cm. The horn is black and about 15 cm tall. Both male and female have it. It doesn’t molt and grow new horn. It is impossible to distinguish male from female by horn or face or body size.There are a lot of blackish brown and grayish brown in body color. But there are differences among individuals. Nihonkamoshika have four stomach for rumination. They often ruminate as they rest and sit down. Under eyes, they have remarkable gland. They secrete from there and mark. The fur doesn’t let water through and humidity retention is high. They mainly eat leaf in forest. In winter, they eat bud and bark. They eat by uprooting plants because they don’t have upper teeth. They repeatedly eat a small amount and move. They eat various plants, for example, Viburnum furcatum BI, Neolitsea aciculata(BI. )Koidz, Llex crenata Thunb, Torreya nucifera(L.)Sieb.et Zucc, Hakonechloa macra(Munro)Makino,Tsuga diversifolia(Maxim. )Mast, Cryptomeria japonica(L.f.)D.Don, Aucuba japonica Thunb, Thujopsis dolabrata Sieb.et Zucc and so on. They mainly graze early morning and evening. Nihonkamoshika’s habitat space is mountain from a low mountain zone to subalpine of Honshu, Shikoku, Kyusyu in Japan. Moreover it is different in its habitat space. Nihonkamoshika in Honshu is bigger than Shikoku. The number of Shikoku and Kyusyu is decreasing now. Nihonkamoshika in Shikoku lives in only Kochi and Tokushima. Nihonkamoshika in Shikoku is about 1300 head. Nihonkamoshika are monogamous. They are curious and like a cliff. When they are chased by dogs, they run away to cliff. They have territory and usually act independently. Male and male or female and female don’t live in the same space. A child drifts away from its parents at one or two years. In autumn they copulate, in spring females have a baby. An average life is four years. The longest life is twenty years. We have a problem. Fields are damaged by Nihonkamoshika. It is the causes of agriculture damage. So Nihonkamoshika have been shot rather than have been conserved. They inhabit mountainous region the eastern part of Kochi. We can see them in Wanpark Kochi. There are four Nihonkamoshika. They are Aki, Ken, Natsu and Tetsu. I made think about problem of Nihonkamoshika again. I think it`s mistake that only Nihonkamoshika see as evil , so humans are evil too. More over, it was surprised that they aren`t dear but bovidae. I thouht they are dear until I read this sentence. I have to study about zoology more. It lived in Kochi Prefecture and it did not know detailed ecology though it knew the existence of Nihonkamoshika. I was surprised to eat various kinds of plants with a male, female feature and herbivore. And, I see that the harm such as ruining farmer’s field is caused. However, I think that being shot and being processed are poor. You may understand a lot reading this article. Hereafter, I want to pay attention to the region more as a person who lives in Kochi. I have seen Nihonkamoshika in a mountain. It’s very cute, but it’s sad that Nihonkamoshika have been shot. I have never seen Nihonkamoshika. I can understand roughly about it. I thought their horn is excellent but actually the horn is very short so I was surprized. 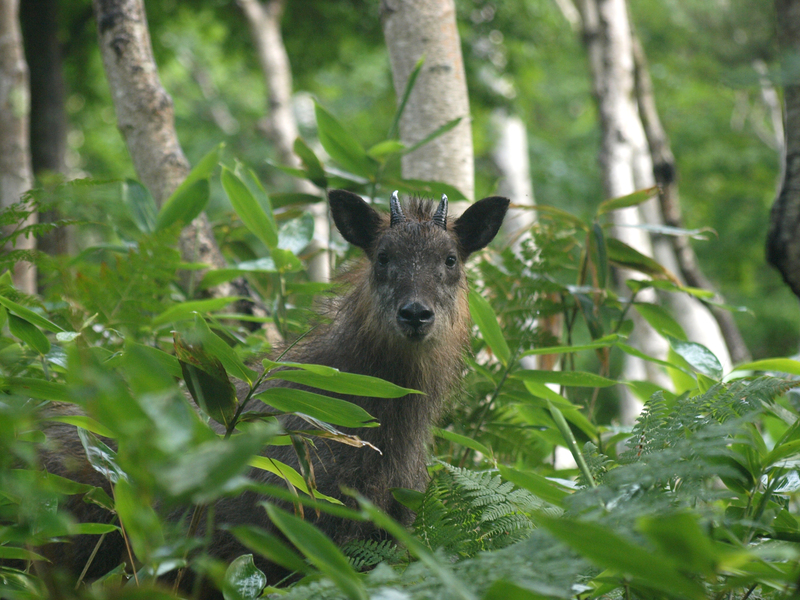 It is too difficult to see wild Nihonkamoshika, if it is possible, want to see it.